He attended Principia 1972-1973 and graduated from Kansas State University in 1975. He then moved to Eugene, Oregon and started working in the lumber industry. In 1979 he married the love of his life, Shelley. Together they have four children, seven grandchildren, three horses, three dogs and a cat. They’re also the owners of Wolf Creek Cedar, specializing in wood shakes and shingles for roofing and siding. Their son, Bo works with them. 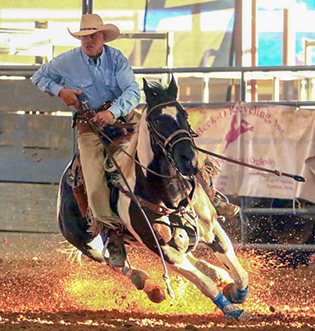 Rob’s favorite hobby is cowboy-mounted shooting, which involves “shooting balloons off a horse while riding through a course as fast as possible,” Rob explains. Riding their horses Maggie and Chama, he’s reached the highest level in six years, in 2018 earning World Champion Senior Men Showcase, American Paint Horse World Champion and U.S. Winter Reserve Overall Champion. Shelley, a practicing Christian Scientist like Rob, has taken up photography and takes pictures at the shoots where they travel. Currently living in Pleasant Hill, Oregon, over the last few years they’ve enjoyed traveling more than 120,000 miles covering 14 states in their trailer with their horses and dogs. Emily is excited to have started the first DiscoveryBound (DB) 20s/30s group for New York City, where she lives and works as an actor and singer. It’s a homecoming of sorts for her – when she was in high school, she headed up the Colorado Springs DB chapter for her fellow high schoolers for three years. “None of the adults were willing to take it on, and when the mom of a guy I had a crush on asked if I would consider taking the reins, well… I couldn’t say no,” she admits. She loved the work, and it set her on a path of frequent volunteering, event planning and leadership service in college and as an adult. She never quite lost her connection to DiscoveryBound. When DB held a teen weekend for performers in NYC, Emily was delighted to be a chaperone, panelist and workshop leader for the many attendees. She still communicates regularly with several of the teens she worked with that year. Recently, Emily found herself yearning for conversations with fellow young Christian Scientists, and no sooner had she asked than she received! A longtime Christian Science soloist, she began to reach out to local churches as a substitute, and as she began to sing at the different churches, she discovered that there were plenty of young Christian Scientists and Adventure Unlimited alums in the area. As she talked to them, she realized she was not the only one yearning for connections. DB NYC 20s/30s officially kicked off this past November with a beautiful Friendsgiving at a gorgeous apartment in midtown Manhattan with 16 attendees! Emily is excited to see how things grow from here and is delighted to be back with the DiscoveryBound family. Nowadays, Emily makes her living as a SAG/AFTRA actor, singer and audiobook narrator. She has narrated more than 200 titles and was the winner of the 2017 MetroStar Talent Challenge cabaret competition at the Metropolitan Room in New York City. Emily was also the original Cat in the production of Stephen Schwartz’s “Magic To Do” on the Ruby Princess cruise ship. She has appeared off-Broadway and regionally with such companies as Reduxion Theatre Company, Vital Theatre Company, Oklahoma City Theatre Company, and the Oklahoma City Philharmonic and has toured with her own show, “Shining, Shimmering, Splendid!” Her New York City cabaret debut, “Uncharted,” received critical praise from both Cabaret Scenes and BistroAwards.com. David first visited the A/U Ranches with his wife, Lesley, in 1980 during a sabbatical leave from lecturing in arts and crafts education at Alexander Mackie Teachers College in Sydney, Australia. 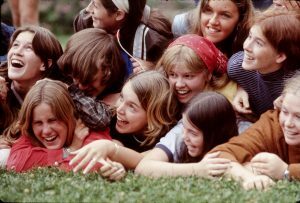 They had been advisers and leaders with Junior Forum for teens during the early 1970s, and after returning to Sydney, David restructured the Junior Forum into an A/U Chapter in 1981. Since then, David has helped organize the Australia chapter activity called Easter Camp, which included individuals of varying ages. He also helped to organize their local Family Camp for a number of years so a second social chapter activity could be offered during the year. 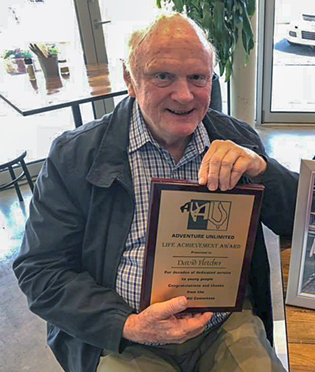 In 2018, upon retiring from more than three decades of this volunteer work, David was honored with a Lifetime Achievement Award for dedicated service to young people by his chapter. And next Easter, he has different plans: He’s joining his family in Europe for a special birthday celebration and tour. David taught design and technology at Huntingtower School in Melbourne for 29 years, served in a number of positions at his Christian Science branch church in Waverly, and was secretary of the Victorian Christian Science Nurses Support Association. Where are you now? Let us know! Probably you are seeking profiles of LIVE Alum, but there’re now plenty who have “changed address” who are nonetheless noteworthy and who were beneficiaries of the camps. Her two brothers, Sam Bort and Dan Bort, also benefited mightily from AU in that decade. Peggy/Margaret hiked in the Sierra into her last months, and all our sons became outdoor enthusiasts. Lots more info and pictures AU/Prin folk will recognize at her Facebook page: Margaret B Imrie. Hi Gordon – thank you for sharing about your late wife and for your idea of profiling alumni who have passed. There are certainly so many wonderful Adventure Unlimited alumni whose stories should be told. We’ll consider this idea – thanks again!